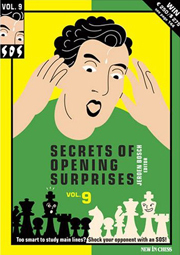 This is our first review of the popular “SOS” (Secrets of Opening Surprises) series, and we waited for the 9th volume to do it. New In Chess, based in the Netherlands, publishes the wonderful Quarterly Yearbook Series (now at volume 88), New In Chess Magazine (8 issues a year and great in depth coverage and articles on top players and tournaments, highly recommended) and reference books. All of the NIC publications and materials are high quality and provide essential information to serious players. The SOS series is also first-rate and caters to players in approximately the 1200-2200 category. Essentially the SOS publications are a potluck of less-explored opening variations analyzed by an IM or GM where players with careful study can snare their opponents into difficult situations. NIC publishes about two SOS volumes per year and the format is nearly identical between volumes. Volume 9 covers 17 completely different variations in 17 chapters with each chapter authored by someone different. Each topic is covered in approximately 8-10 pages through a combination of variations and illustrative games with sub-variations included. The beauty of this approach is that in just 8-10 pages you can hit on the key ideas and provide plenty of food for thought for prospective players. The flip side is that some of the variations are probably second-rate and you may end up more surprised than your opponent was supposed to be! The key to a successful SOS is both an innovative approach and the ability to predict when our opponent will be caught off guard. Some of the variations are almost amusing, witness chapter 15, the “Ruy Lopez: Popov Variation.” In the game, Nikolov-Popov, Sofia 1990, black won a piece and the game as follows: 1 e4 e5 2 Nf3 Nc6 3 Bb5 a5!? (not a misprint, everyone knows 3…a6) 4 d3 Na7! 5 Bc4? b5 6 Bb3 a4! and white had to part with the bishop. Jeroen Bosch, editor of this chapter, goes on to say that 3…a5 is inferior to 3…a6, but since he can find no refutation to 3…a5 it’s worth playing anyway. I can’t really argue with that statement, although we may wait a while before Kramnik, Anand, or Topalov include 3…a5 in their own arsenals. For mid-level players or even masters, I think pulling out 2-3 ideas per volume and including them in your repertoire could net you some points. Most of the variations start as early as move 3 or as late as move 14 with the emphasis on early deviations from main line theory. A couple of interesting selections from volume 9 include 1 d4 f5 2 Nc3 Nf6 3 g4!? (Bogolujbow Gambit, p. 109) 1 e4 e6 2 b3 d5 3 Bb2!? (Reti’s Line vs. the French, p. 102) and 1 e4 c5 2 c3 d5 3 exd5 Nf6!? (Scandinavian motif in the Alapin, p. 52). The publication quality is high and the material easy to follow. My only caution regarding this publication or any of the other volumes relates to the “surprise” factor. I would recommend that players test these ideas on their own against strong computer programs or in informal games before adopting them with confidence in that crucial last round game. That is true for any opening of course, but your margin for error in these SOS variations is considerably narrower. Although the individual authors have a clear bias in favor of the surprise weapon of choice, they are generally reasonable about highlighting the problem areas or game fragments where the SOS did not pan out. There are numerous suggestions by the authors in every chapter but untested analysis can be flawed. Tread carefully, but at least know that with your opponent’s clock ticking, the pressure will be on him to withstand your aggressive assault. Readers might ask which, if any, of the 9 volumes would be a best buy or if all 9 should be on their bookshelf. I would review the contents of each volume and at least consider picking up 1-2 editions based on opening variations you would like to explore further. The slight risk is that your opponents may pick out SOS’s that you’ve never studied and you could be on the receiving end. This just proves that there is a lot of unexplored opening theory and chess continues to be remarkably innovative.